"But what of you? Where are you? Tell us more about this green woman and how she trapped you!" The voice fades mysteriously at this point. "Caradoc, take Ysa and McGeeber* -- see if you can find out how we're trapped or whatever else you can learn about the area. Coll, take the other rangers* and keep them covered, maybe up on that curtain wall. I'll go back into the cavern and see if we can figure out the runes. Oh, and Caradoc? Let's have Fido go with you for now. He doesn't like the cavern, and now I think we know why. * McGeeber is the name of the dog, if I haven't named it already. I can't recall but I think we have six rangers total? Er...nope. The dog's name is Corsa. You have Talin, Caradoc, Coll and Ysa, which is 4 rangers, plus a thief (Anna) and a fighter (Kilian). OK? I assume Talin and Kilian are going below, with Anna? That would leave Caradoc with Ysa and her dog Corsa to figure out why you are trapped, and Coll to stay on the battlements with a bow. Correct? "Caradoc, take Ysa and the dogs -- see if you can find out how we're trapped or whatever else you can learn about the area. Coll and Anna, try to find some high ground and keep them covered, maybe up on that curtain wall. I'll go back into the cavern and see if we can figure out the runes. " Caradoc and Ysa manage to work out pretty quickly that as soon as anyone tries to leave this area, wild trees become activated and will attack you. They are not surprised when the first attempted attack happens, and back off out of the range of the wild tree's branches. Anna can see the shadow shapes moving towards the trees where the rangers and dogs are. They fly very fast. From up on the battlement, she gets a full view of your predicament. There are hundreds of wild tree shapes in a ring around the old castle. There's no way you could get through without coming within melee range of many of them. Meanwhile down below - what are you doing? You go in via the stairs and the runes there are exactly as you left them. What do you do? Kilian and Talin will stare at the runes a bit but probably not do anything eventful. Once Caradoc is done with his patrol, he'll send Ysa and the dogs up to Coll and join the two in the cavern. There! Now we have three non-wizards attempting to defeat the runes. "I reckon we just hit dem runes with an axe." says Kilian. "Has 'brute force' ever been a good solution for defeating magic wards?" replies Talin. "Well I suppose ye haf anoder elf mage in ye backpack den? Or mebee in a mirror?" retorts Kilian. "Hmm... Kilian, do you think this is the hag's lair? Look -- an exit to the river, an exit up, and runes at both exits. Runes surrounding this area. There's the smell of peat which surely means hag. Yeah, I really wish Tiana were here. She'd know what to do next with these runes." Kilian studies the runes as well. "Mebee we ken recharge dese ruins? I dunna know 'ow dough." He'll pick up the manacles and inspect them (gulp!). "I dunno boy. I'm just a simpul smith." He'll look at the rock and the iron chain as well. Talin fakes a glare at him. "Well whatever it is, we're not going to get anywhere at this rate. Let's go get Anna. She had the only tingly sense here -- that and Fido." "Anna, that missing feeling you have -- I have a brave question for you. Does it feel more 'missing' as you get closer to where this creature was shackled?" Kilian has an idea as well. "Boy... wat if dis prison took away 'er powers and dat 'ag 'ad ta climb out wit 'er own claws? I bet dey be strong enough to do dis, wit enuf time." Talin and Anna look at each other. Kilian continues, "And if dat be true, dis may be safer dan out on dem 'alls." Talin nods slowly, and goes to the stairs to bring the other rangers in. He'll try to coax in Fido as well. * I'll spare you the drawing itself. Talin is trying to figure out if he saw this on the crystals that were sold to the trader or in Boldenwald itself. He'll pick up the manacles and inspect them (gulp!). Very luckily, Kilian is not grappled by the hag. He may act. Talin may also act. Then it's a new round. Kilian is in melee. Sorry for the delay. I thought I posted, but it's clearly not here. Kilian will retreat out of the runes. Anna and Talin will both shoot at the hag, taking the -4 "don't hit Kilian" penalty if necessary. Is Caradoc here? If so, he'll shoot too. If not, Talin will call for him. Caradoc and Anna can be present on the cavern. I've rolled randomly and it turns out that everyone had their bows out except Kilian, who was with his axe. Kilian jumps back outside the runes. The hag reaches their limit and clearly can not go past them. Three arrows fly in her direction. Only Anna hits. 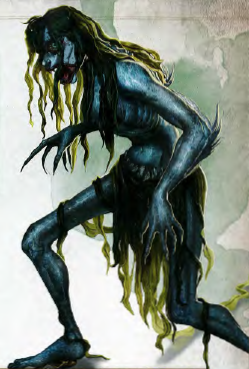 The hag rips the arrow out of her arm and green blood drips down. She transforms into a beautiful woman in a green gown. A spot of blood is still visible on the sleev. She speaks common. Her voice is recognizably the same one you heard calling from outside the cavern, a few moments ago. "You would be very unwise, to kill me. Only I am capable of commanding the Daghdatha (tree spirits) to let you leave. And how am I to do that, if I am dead?"